The news report about the ban of Google Mappers from US Military bases prompted me to write this post. that photography was prohibited in the Airport; whats more, she wasn't even allowed to use her mobile cam. A policeman even made her delete the image of a Lufthansa Jumbo jet parked on the tarmac, citing security concerns. 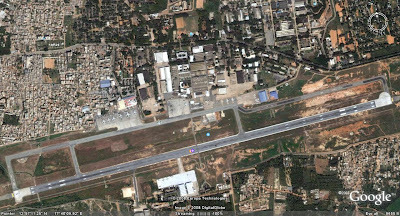 I thought it might be because of the fact that the HAL Airport also had a military component attached to it. I myself had similar experience at Trivandrum Int'l Airport, where Southern Air Command was operating. Perfectly understandable, and as patriotic citizens we wont indulge in acts which compromise national security. Just enter Bangalore Airport images on any search engine and you will get an overwhelming no: of photos of the airport, layout, runways, flights, interiors and whatever you need. Websites offer more than enough details of all the airports in the world. Even worse, tools like Google Earth & Google Map are making an absolute mockery of the 'security laws' we have around us. I'm a member of the online community Skyscrapercity, which is a first class arena for urban photos and discussions. That explains my interest in Bangalore Airport photos. The utter asinine nature of the rules are blown wide open if you view the photo galleries in the site. Thousands of pics taken from the aircrafts, tarmac and terminals lay tribute to the agile & efficient forumers. Leave aside airports, one of the members even reported that he was reprimanded when trying to secure some snaps of the Big Bazaar, a cheap-commodity supermarket in downtown Trivandrum! Me and my friends landed in hot water after posing for a group photo in Mumbai'sVictoria Terminus a few years back. Lastly, the revelation that Trivadrum Airport departure area was also a 'no photography' zone thoroughly confused me. What could be the real issues behind these restrictions? The last choice appeals most to me. What else would obstruct a young girl from picturing a modern commercial jetliner resting on the parking bay? raised an eyebrow; some snaps were even taken for me by security officials. But when it comes to aamchi India, the camera turns a potential grenade.